The Embassy of Ukraine in Italy has said pro-Russian forces in Verona (Italy) staged an act of anti-Ukrainian provocation, announcing the opening of the so-called "DPR [Donetsk People's Republic] office." "The Embassy of Ukraine strongly condemns any attempts to promote and support terrorist groups in Italy – fake 'republics' in the territory of Ukraine's Donbas, which is unacceptable not only for an EU member state, but also for any society that shares democratic values and basic rules of the modern world order," the diplomats wrote on Facebook. 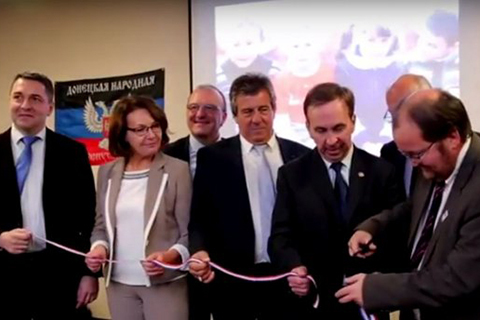 "The latest anti-Ukrainian provocation by local pro-Russian forces in the Italian city of Verona, which announced the opening of the so-called 'DPR office in Verona' on February 9, refers to such shameful actions," the statement said. The embassy and the Ministry of Foreign Affairs of Ukraine are taking measures of a political and diplomatic response: a relevant note verbale has been sent to the Italian Foreign Ministry, requests have been sent to the prefecture and questura [police headquarters] of Verona, protesting against anti-Ukrainian provocations aimed at undermining the European position in support of the territorial integrity of the Ukrainian state. What is more, the legal status of that "office" is being clarified. The diplomats say "another anti-Ukrainian action of local pro-Russian politicians in the city of Verona, according to a scenario written by Kremlin puppeteers, has already aroused outrage not only from the Ukrainian community of Italy, but also from many Italian friends of Ukraine, who express support for our state." "The fact that controversial local official Palmarino Zoccatelli – the 'head' of that fake 'office' – took part in the action comes as no surprise for those who are familiar with his biography: he had headed the 'Regional Committee for the Independence of Veneto' for a long time, but with the beginning of Russian aggression against Ukraine, he became a fervent 'promoter' of contacts with temporarily occupied Donbas," the embassy said. "Unfortunately, there are political outcasts in Italy, who are obviously ready to further increase the level of provocations and make efforts to gain greater favor from Moscow supervisors. However, we are convinced that the aforementioned unlawful actions of certain representatives of the local Veronese political force will not be able to cast doubt on the Italian government's firm position in support of Ukraine's sovereignty and territorial integrity," the statement reads.